Reed Exhibitions hires Hoffman; doing Muhammad Ali's PR; DAN big on growth; China v US at sea; Uber's 'cute' says Didi; co-working in Asia; eBay not Amazon. 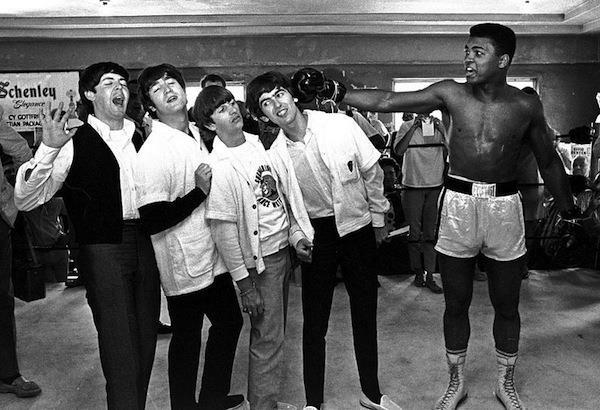 The iconic Muhammad Ali, who died on Friday, in a world renowned shot with the Beatles. The events company has looked to Hoffman once more for its BEX and MCE conferences in Singapore. PR veteran Alan Taylor remembers hanging with Muhammad Ali - then Cassius Clay - in the 60s and publicising his iconic world-title fight with Sonny Liston. Dentsu Aegis Network hires former Google executive to push performance marketing in North Asia. Tensions between the US and China continue to escalate as the two economic powers refuse to see eye to eye on the South China Sea dispute. Ride-hailing rivals Uber and Didi Chuxing continue to battle for market share in China, both announcing new funding this week. But Didi Chuxing's president, Jean Liu, downplayed any competition. From The Hub to The Hive, there's no shortage of co-working spaces popping up throughout Asia. Now, New York-based, WeWork is planning to expand in the region this year by opening initial locations in Hong Kong, Shanghai and Seoul, a senior executive told CNBC. EBay isn't just where you order a used cellphone anymore, at least according to company CEO Devin Wenig. In fact, used item sales are making up a small and declining part of the eBay business. It's all about perception, Wenig said onstage at the Code Conference, and eBay isn't just an auction site anymore. But it's also not trying to be Amazon.